Lauzerte is 15 kilometres north of Moissac in the Tarn-et-Garonne region of the Midi-Pyrénées. 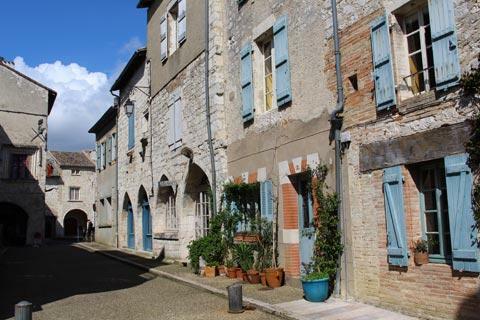 It is a lovely small bastide town, founded by the Count of Toulouse in 1241, that is set along the top of a small hill and now officially included among the 'most beautiful villages of France'. In fact there was a settlement here even before this time, as a Gallic settlement more than 2000 years ago, then as a castle and small village from the middle of the 12th century. In medieval times it also became an important town for pilgrims. 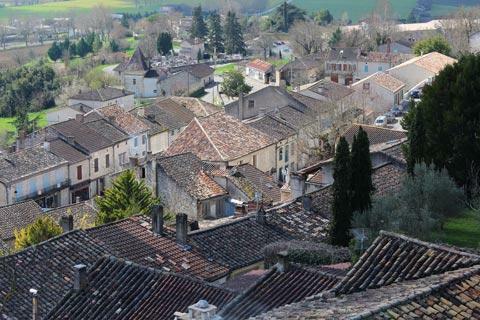 Most visitors will approach the village from the south, driving up the long hill to reach Lauzerte. 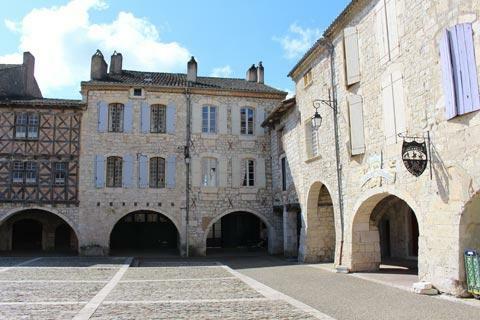 Park just outside the historic centre, from where you can easily reach the attractive arcaded main square, the Place des Cornieres, in the centre of the village. 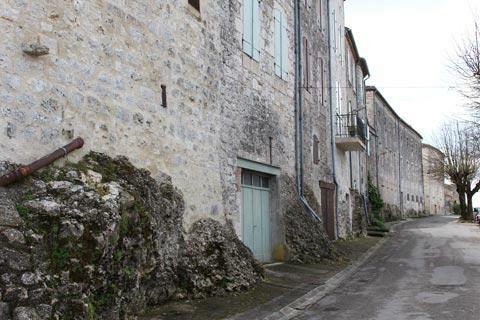 This is one of the best preserved bastide village centres in the region, with most of the houses in the local light stone and one in colombage. 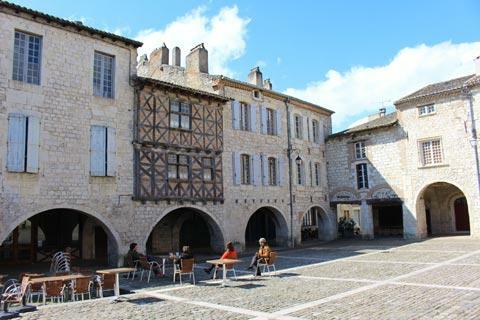 The Place des Cornières is one of the smallest central squares that I have seen in a bastide, which also adds to its charm and intimacy. One curiosity in the square: they have raised one corner of the paving in the central square in the air, presumably in an effort to be artistic. Personally I just thought it looked a bit odd! 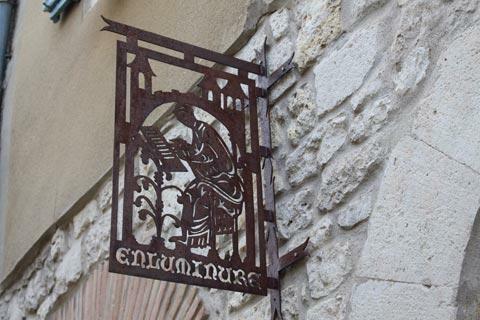 Many of the shops and cafes have traditional wrought iron signs representing their trade which adds to the authentic medieval feel of Lauzerte. France This Way comment: although it is a small village and rather off the beaten path we highly recommend a visit to Lauzerte if you are in this part of France, or as a detour if you are visiting Moissac. Much of the village has been extensively renovated over the last 10 years. Many of the houses around the centre still retain their original arcades and there are several cafes and bars among these arcades. In Le Puits de Jour it was possible to eat a small 'main course' (salad or chilli con carne etc) for just a few euros. This is worth knowing because eating out at lunchtime in France without having to pay for a three course meal is often a challenge! The Church of Saint-Bathelemy is in one corner of the Place des Cornieres. When you see the entrance you will think you are seeing the original 13th century church, but in fact apart from this entrance the rest of the church has all been modified and rebuilt over the centuries. 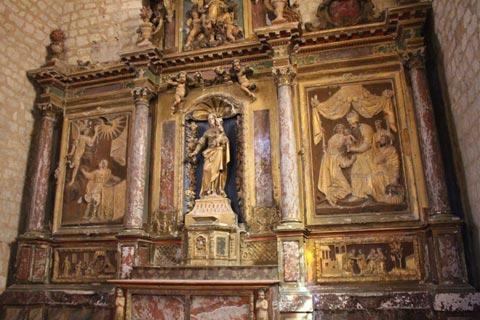 Highlights inside the church include the gilded altarpiece in the baroque style and an interesting statue of Christ, made of leather by a prisoner in exchange for his freedom, as well as the stalls and various paintings. The side streets that radiate off from the square also contain a large number of attractive medieval houses. 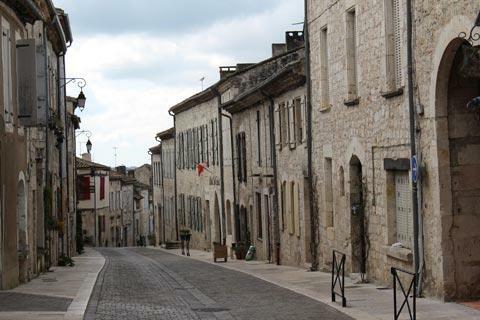 You will notice that Lauzerte doesn't have the usual grid pattern of streets found in a bastie town, but is based along two parallel main streets: one north of the Place des Cornieres and the other to the south. This different layout is because of the constraints of the hill on which the village was built. 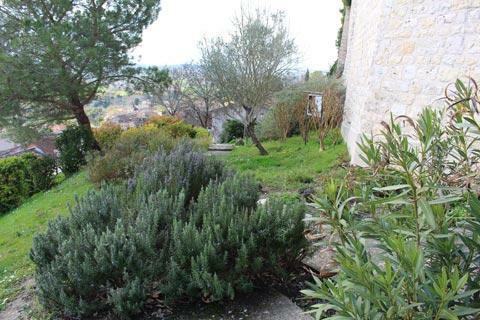 There is also a well planned 'Pilgrims garden' on the southern edge of Lauzerte that follow around the curve of the hill and has won various awards from regional tourist boards and deserves to be explored, and from where there are also extensive views to the south across the Lot countryside. The garden is here because Lauzerte is a stop on the major pilgrim routes through France (it is on the GR65 national pathway). 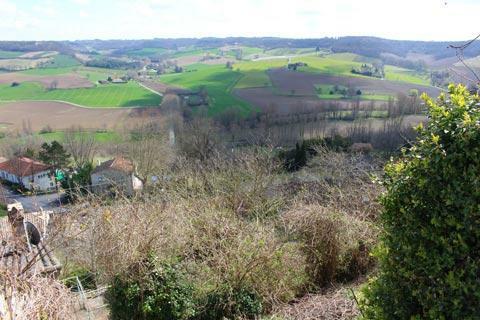 On the northern edge of the town you can walk along below the tall stone houses along the Promenade de l'Éveilh which also has open views over the surrounding countryside. Market day is Wednesday morning at the Place du Foirail and Saturday morning at the Place des Cornieres. 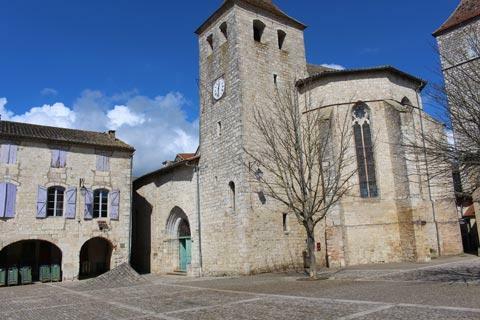 If you would like to explore the countryside around Lauzerte there is a walk of about 11 kilometres (three hours) that explores to the south-east of the town and starts from the Promenade de l'Éveilh called the Circuit la Chapelle Saint-Sernin. The best known attraction in the region is undoubtedly the famous abbey and cloisters at nearby Moissac, and we also enjoyed a stroll around the historic centre of Montcuq village, north-east of Lauzerte.